Wheeler QD, Knapp S, Stevenson DW, Stevenson J, Blum SD, Boom BM, Borisy GG, Buizer JL, Carvalho DMR, Cibrian A, et al. Mapping the biosphere: exploring species to understand the origin, organization and sustainability of biodiversity. Systematics and Biodiversity. 2012 ;10(1):1-20. Tanner S. Orion: An Open Source Collaborative Framework. In: Geo Huntsville Conference. Geo Huntsville Conference. Huntsville, AL: Geo Huntsville Conference; 2012. 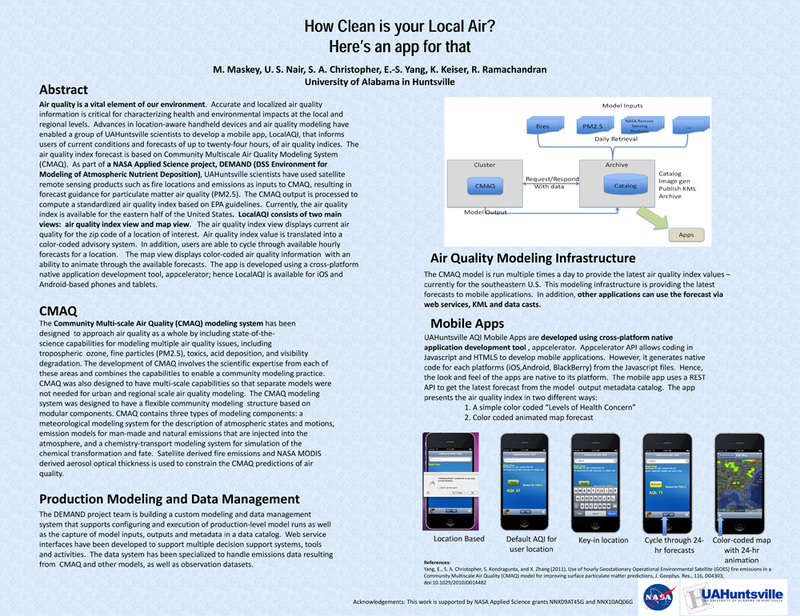 Keiser K, Nair U, Maskey M, Y W, Christopher S. Report on Air Quality Projects in Alabama and the Southeastern US”, . In: Geo Huntsville Conference. Geo Huntsville Conference. Huntsville, AL: Geo Huntsville Conference; 2012. Ramachandran R, Maskey M, Kulkarni A, Conover H, Nair US, Movva S. Talkoot: Software Tool to Create Collaboratories for Earth Science. Earth Science Informatics. 2012 ;5(1). Hoy H, Alexander S, Maskey M. Technology for the Transplant Professional: Making it work for you instead of against you. In: NATCO Symposium for Advanced Transplant Professionals. NATCO Symposium for Advanced Transplant Professionals. Miami, FL; 2012. Nair US, Keiser K. Air Quality Science Supporting Decision Making for the Alabama Forestry Commission. In: UAH Atmospheric Science Dept. Weekly Brownbag. UAH Atmospheric Science Dept. Weekly Brownbag. Huntsville, AL; 2011. Keiser K, Maskey M. Data Casting for Integration of Applied Science Projects. In: ESIP Winter Meeting. ESIP Winter Meeting. Washington D.C.; 2011.